Then up spoke the captain of our gallant ship, Who at once did our peril see, " I have married a wife in fair London town, And this night she a widow will be." And the land lubbers lying down below, below, below, And the landsmen were all down below. 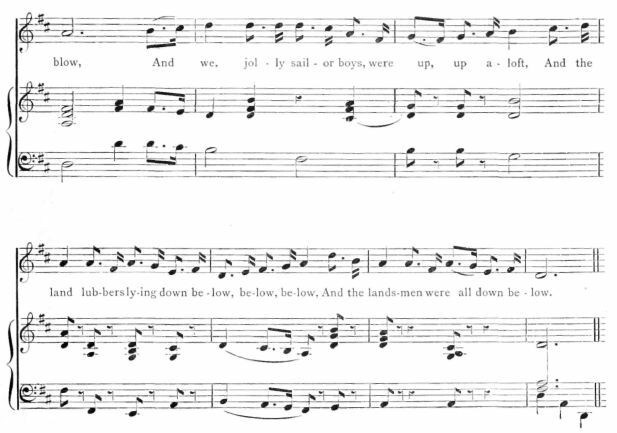 And then up spoke the little cabin boy, And a fair hair'd boy was he; " I've a father and mother in fair Portsmouth town, And this night they will weep for me." For the raging seas, &c.
As she sunk to the bottom of the sea." For the raging seas, &c.